"Victoria's Empire," a three-part series from BBC1 starting Sunday, April 29, takes viewers on a tour of former outposts of the British Empire. In the first episode, presenter Victoria Wood travels to Kolkata, where she explores the remains of the British Raj and finds some very well-preserved Victorian buildings. She chats with resident Toby Sinclair and discovers how the British learned local languages. Then it's up to Darjeeling where memsahibs avoided the hot summer weather and where taking tea wasn't the only diversion. Wood also visits Hong Kong and Borneo, where she comes face-to-face with the descendant of a chief head hunter, bird's nest soup, and a baby orangutan. In future episodes, Wood visits Ghana, Jamaica, Newfoundland, New Zealand, Australia, and Zambia. No doubt this series will show up on American public television in the not-too-distant future. Not having seen it, I'm not in a position to judge it. It strikes me, however, that what is truly needed today is not a chirpy, whirlwind "highlights of empire" tour but an informed discussion of the British imperial legacy (both good and bad) and how it has fueled contemporary geopolitical conflicts. Not as riveting, perhaps, as watching Wood experience her first taste of bird's nest soup, but surely more important. The Manchester Evening News has just published this more optimistic preview (26 April 2007). 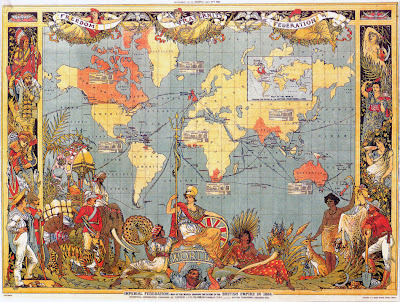 Shown here: Imperial Federation "Map of the World" showing the extent of the British Empire in 1886. Click on the image for a larger version. If the Victoria Wood in question is the Victoria Wood, then it will indeed be 'chirpy': she's a (very good) stand-up comedian and comedy writer.